As we left Michigan we decided our next stop should be Minneapolis because Bob was flying to Pittsburgh and needed to be near an airport. 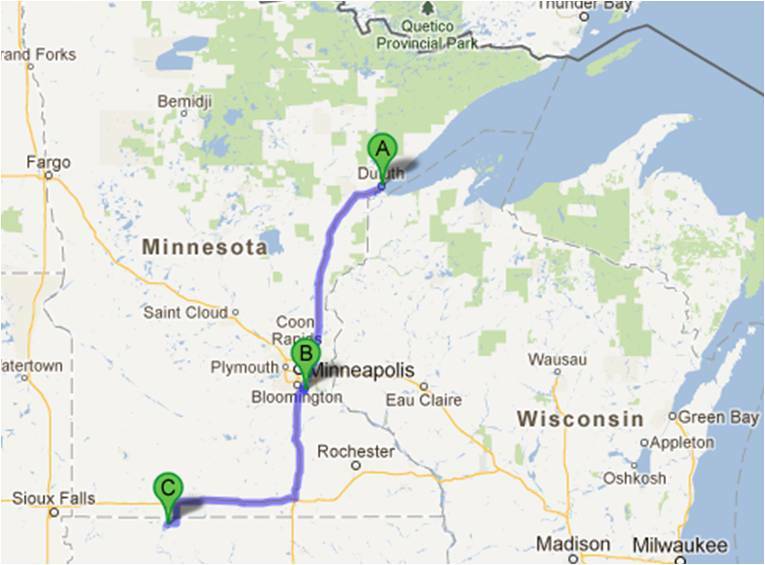 On our way there, we decided to break up the trip by stopping overnight in Duluth, MN. 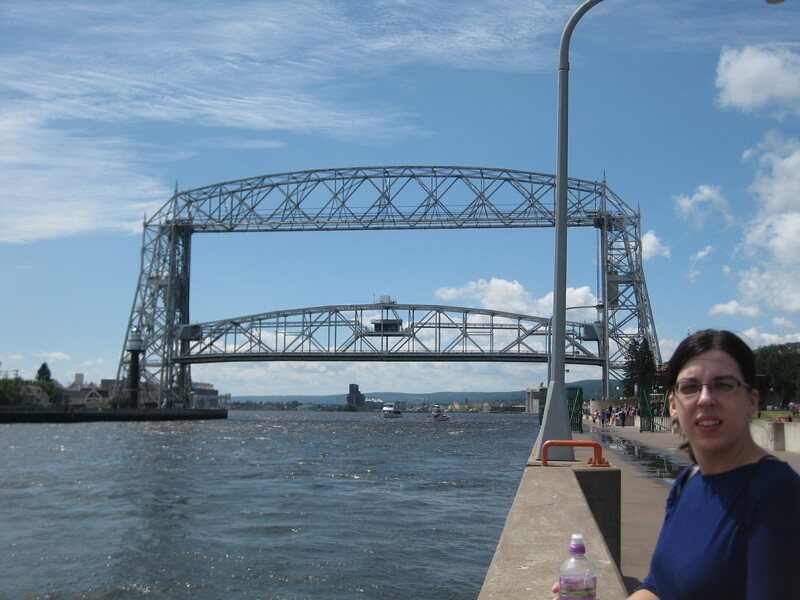 We had no idea where to stay but we discovered that the Lakehead Boat Basin, just past the Aerial Lift Bridge in downtown Duluth, has RV sites. The RV sites are nothing more than sites on the parking lot where they store boats in the winter, but it fit our needs perfectly. We arrived around lunch time, got set up, had lunch and then walked the few short blocks to Canal Park Area. 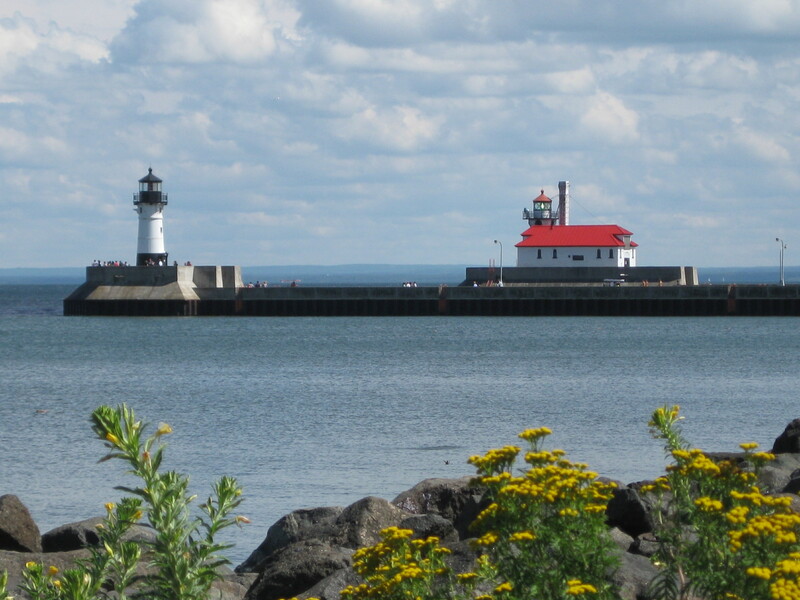 The first place we stopped was the Lake Superior Maritime Visitor Center and took a tour of the Duluth ship canal and the three lighthouses on the canal wall. The Canal Park area is loaded with various shops and restaurants and we wandered through most of them. 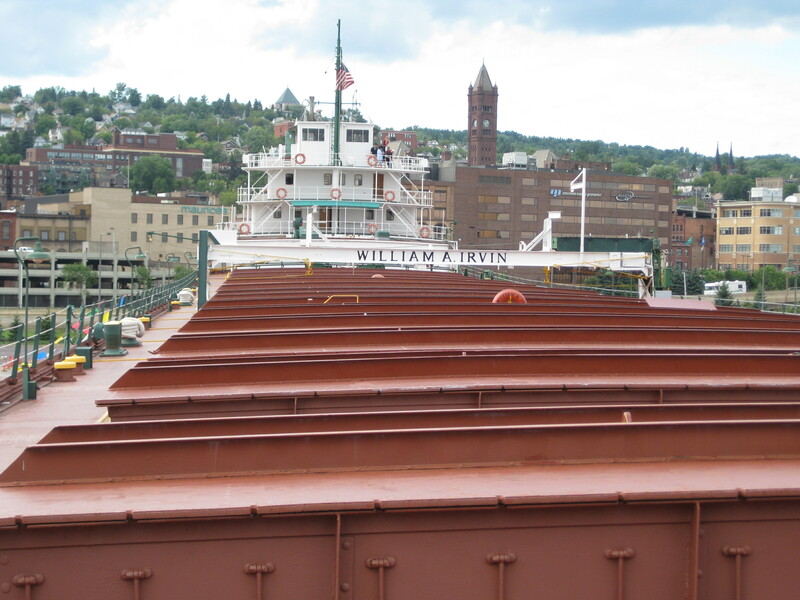 Bob took a tour of the William A. Irvin, a Great Lakes Iron Ore ship that was turned into a floating museum and then we had dinner. After that we headed back to the RV to watch the Olympics. After more than two weeks without TV it was a treat to see what was going on with our athletes in London. The next morning we did a walk along the Lake Walk, an exercise/walking trail along the lakeshore, a great way to start the day, then we packed up and headed for Minneapolis. In Minneapolis we stayed at the Lebanon Hills County Park. It’s one of the unique campgrounds where you can be in the middle of a metropolitan area, but still feel like you are out in the country. Bob took off for two days for his Corps of Engineers training program. 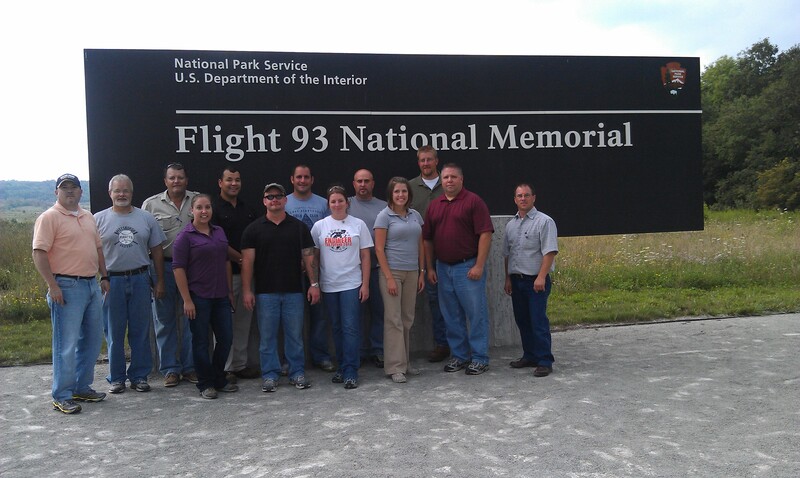 As a part of this program he takes his class to visit the Flight 93 Memorial in Pennsylvania. We both visited it last year a month before it was open to the public. This year’s visit was even more impressive. Because the program is presented to the class by the Deputy Superintendent of the National Park Service district, the class is able to see parts of the site not accessible by the general public. The class visited the VIP viewing area. That is the closest anyone can get to the actual point of impact other than the families of the passengers and crew of United Flight 93. This is the site of the first battle with a foreign enemy on U.S. soil since the War of 1812 and is both a humbling and inspiring experience. While Bob was gone Pat had posted on Facebook that she was in the Minneapolis area and one of her high school classmates who lives in Minneapolis contacted her and showed her some of the local sites. When you are in the Minneapolis area, the Mall of America is on the list of things to do and we did that the day after Bob return from Pennsylvania. We picked up a small table we wanted for the trailer at Ikea, had lunch at the Mall, but didn’t buy anything there. I doubt that most people could say they went to the Mall of America and left empty handed! We left on Saturday, August 11th and traveled to Spirit Lake, IA and spent the night with our nephews, Matt and Adam. They both work at a windmill farm in Minnesota and live in a house just over the border in Iowa. They have a very nice place with a great view, just the right place for two guys who grew up on a farm. We fixed them a home-cooked meal that was greatly appreciated and they let us camp in their driveway. The next day we were back on the road for a long drive to the Badlands National Park in South Dakota. This entry was posted in Michigan Traveler, Minnesota, National Parks, South Dakota, Working on the Road and tagged Aerial Bridge, Duluth, fifth wheel trailer, Flight 93 Memorial, full-time RV, fulltime RV, Lakehead Boat Basin, Leadership Development Program, Lebanon Hills Campground, London Olympics, Mall of America, RV Forums, William A. Irvin. Bookmark the permalink.